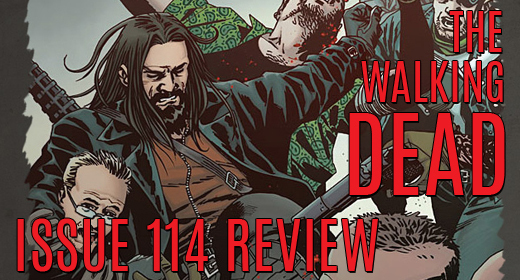 Comic Review Friday: The Walking Dead Issue 114! We only have one more month to wait until “All Out War,” and things have hit the boiling point in The Walking Dead universe. This is not surprising though, considering that Kirkman is a master at ramping up the tension at break-neck speeds when he deems it necessary. He is also a master of creating engaging characters, and this issue focuses heavily on Jesus, who has not been given much time to shine lately. The tagline “What would Jesus do?” was probably overkill, but I cannot blame Kirkman for wanting to cash in on one the most popular characters in the series. The issue does slow down in the second half, which serves to set-up for the start of “All Out War” next month. We see Rick and company discussing how Rick’s actions have set the group back since they lost the element of surprise, while Rick still thinks they have advantage. Jesus, Andrea and Michonne all confront Rick about how stupid his coup attempt on Negan was, and it serves as some of the best dialogue the book has had in a long time. Kirkman has knocked it out of the park again with this issue, making it two in a row. I am more excited now for “All Out War” then ever. This issue gives me faith that by the end of the series that we will have another issue 48 moment of shock, which is great for the series. I hope Kirkman can keep up this level of storytelling, because he is poised to deliver one his best ever. I give it a four and half stars out of five.